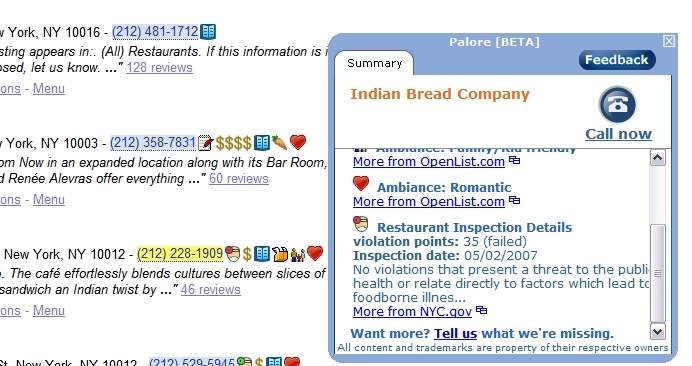 I met the other day with Palore, an Israeli startup offering a plug-in/download that adds more content, structure and even branding to search results. They’ve started by offering this information in the local search space, but what I’m saying here equally pertains to general search — as the tag line, “the ultimate search companion,” implies. 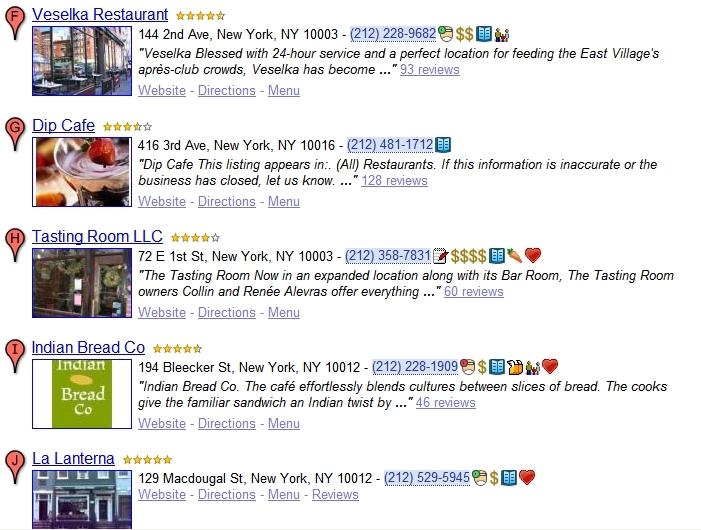 That reveals the restaurant failed its New York city health inspection, information that wouldn’t have been otherwise found in that search result. Anything can be put in this window: fair trade coffee, vegetarian, wi-fi, availability and so on, as the icon chart above suggests. The idea is to surface more content — and even obscure but relevant content — at the highest level of search. 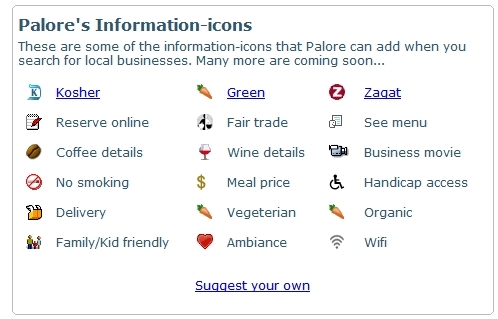 Palore offers click to call (which is somewhat redundant in Google or Microsoft’s case) as well. On the latter point, imagine that your site is being lost in a sea of generic search results. Now imagine you could add a logo or icon to call out your results from the others. 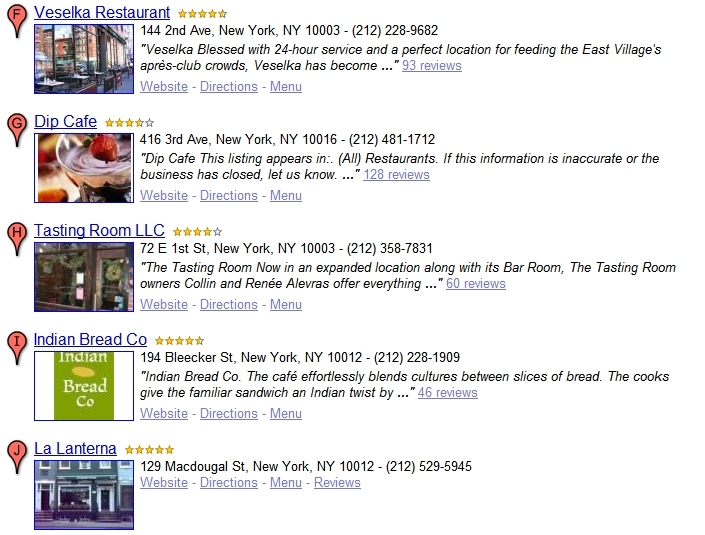 This is branding in the context of search results, which is right now not otherwise possible. It presents a range of interesting opportunities to publishers who have been struggling with how to deal with search engines’ hold on consumer attention. If you’re the New York Times, for example, and you’re just one of dozens of publisher sources that come up when news-related searches are performed, this permits you to add your logo and call users’ attention to your content (vs. others) on Google or Yahoo search results. It doesn’t do anything for your position per se, but it can make that position potentially stand out. And that would go for a YellowPages.com or a Citysearch or a TripAdvisor. The challenge of course is getting consumers to download the toolbar/plug in, which is always a challenge but can be overcome. There’s a good deal more to say but that’s what I have time for. This entry was posted on May 24, 2007 at 9:02 pm and is filed under Local Search, Mapping. You can follow any responses to this entry through the RSS 2.0 feed. Both comments and pings are currently closed.